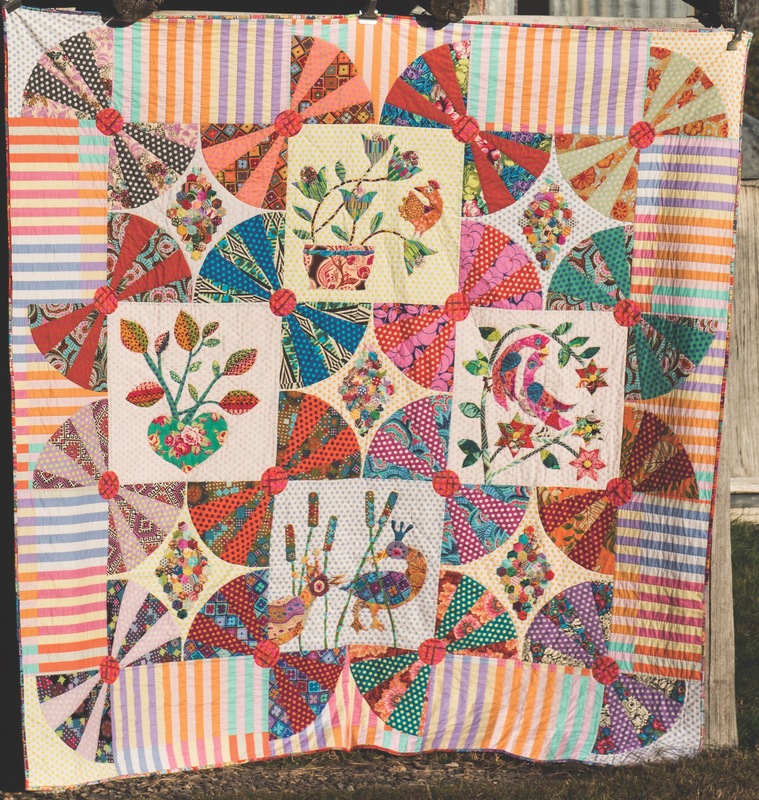 Love Birds from Mixing Quilt Elements is a perfect quilt sample for a multi-session class plan. The techniques covered include appliqué, paper piecing, wedges, and lots of room for talking about using fabric. The participants can be invited to share their own interpretations of the designs or to use the ones provided. This is best suited to 3-4 sessions lasting 3-6 hours each. Perfect for a term class. Backgrounds: Consider a small regular print in a light color, a low volume print, or go bold and try a plaid! Please note: the sample shows Kaffe Fassett dots in the pastel colors. If you choose one background you will need 2 ½ yds (9 fat quarters and four 10 ½” squares). Fans: Consider selecting two fabrics for each set of fans—one big print and one spot or graphic print. Border: Consider a stripe or graphic print. The border can be selected after the blocks are completed. Iron, mat, rulers, cutters, sewing machines and general supplies. Design wall for each student or to share. Teacher Preparation: Step out cutting wedges. Step out appliqué steps with Wash-Away Appliqué Sheets. Step out hexagons. Quilting sample. 1. Review fabric selections of participants. 2. Discuss the layout and fabric strategy. 2. Select pairs for the wedges. 3. Demonstrate cutting and sewing wedges. 1. Demonstrate selecting fabric with viewing templates. 2. Using Wash-Away Appliqué Sheets it is easy to transfer the designs. 3. Demonstrate tracing, cutting (and cutting away the middle), then iron onto fabric and cut away. 4. Demonstrate positioning and sewing appliqué shapes. 2. Demonstrate cutting and gluing fabric to papers. 3. Demonstrate sewing hexagons together. 4. Demonstrate appliqué of paper-pieced section to the background. 1. Demonstrate hand-quilting method around the appliqué. Many people are hesitant to use large-scale, colorful prints. 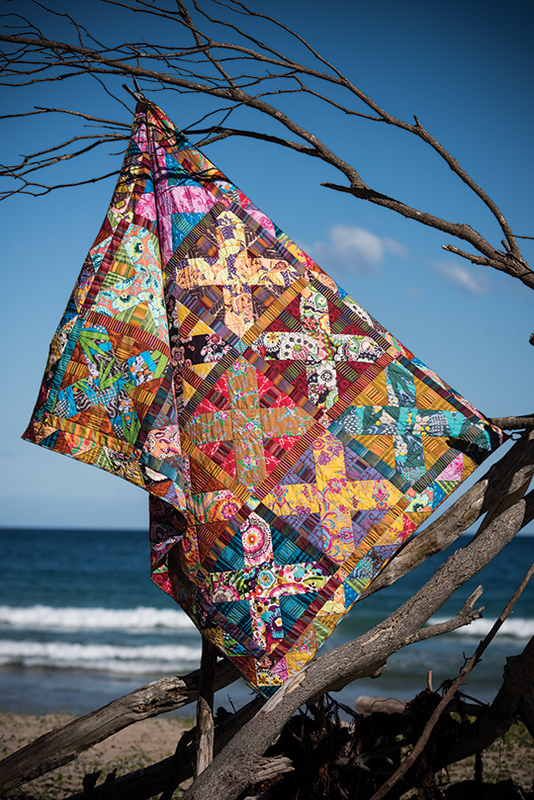 Color Works is an easy block to assemble that allows the maker to really concentrate on what fabric choices are available. The feature prints are shown off as hero fabrics by using low-key tonal prints for the background and stripes for the sashing. In a 3-hour class, students may finish 1-2 blocks. In a 6-hour class students may finish 3-4 blocks. Mats, cutters, rulers. Steam irons. Design wall. Instructor Preparation:Include, in the handout, a reference to Choosing Fabric for Color Works (p. 101)—this chapter handles the best practices for choosing fabric, with references to specific designers. 1. In a shop, I often do a walk-through of the different sections of the shop, talking about buying habits and extending the individual comfort zone of the participants. This exercise isn’t about changing their taste but rather about introducing them to fabric they may not have considered previously. 2. Do sample blocks in different styles. For example: Contemporary designers as per the sample using available prints, fussy-cut novelty prints, Japanese wovens, or pretty floral fabrics in soft colors. 3. Step out the cutting instructions and go through these with the participants. 4. Demonstrate sewing the step outs. 5. Wrap around the room and review the variety of samples being made in a complimentary manner. Encourage good sewing techniques. For examples of student work, visit @matobsgirl on Instagram or my blog http://www.materialobsession.typepad.com/.